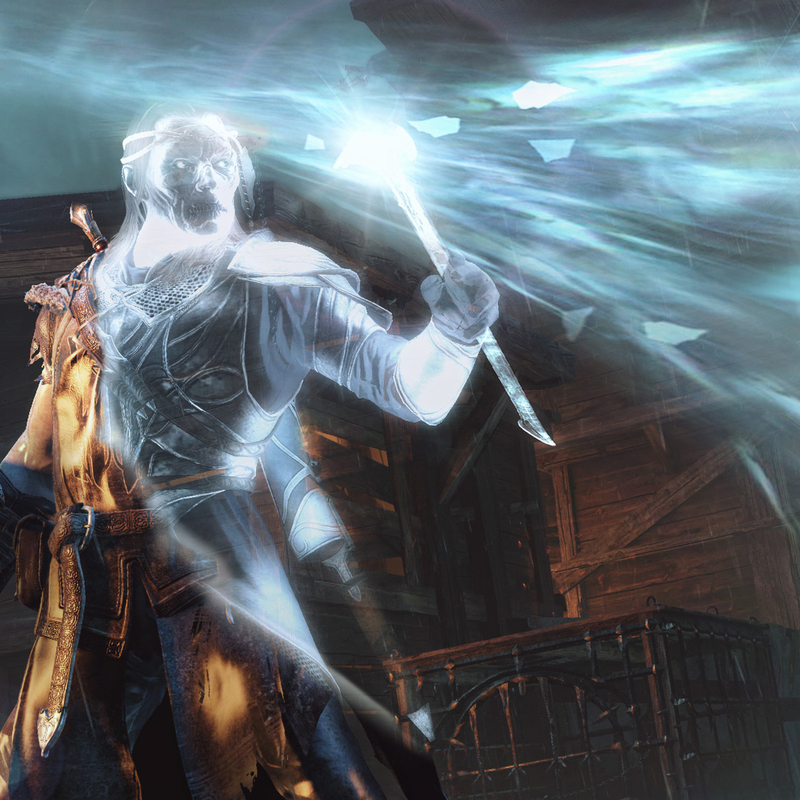 In today's Shacknews Spotlight, Steve Watts and Steven Wong walk in the Shadow of Mordor. We discuss the art of hunting Uruk captains, the Nemesis system, and becoming lunch meat for a wandering caragor. Steve Watts: This is a game that really seemed to sneak up on everybody. Even as the reviewer, I wasn't really sure what to expect from it. I think what surprised me--and judging by the reviews, surprised just about everybody--is how well the Nemesis system works. I know it's all procedurally generated and randomized traits, but when you do get downed by an Uruk a few times and he keeps increasing in power and boasting, it is incredibly satisfying to take him down. Steven Wong: I think perhaps the Nemesis system was implemented a tad too well. I spent hours hunting down captains and thinning out the ranks, and then realized that I wasn't furthering the plot. A lot of the abilities rely on campaign progress, so sometimes it almost felt like a chore to trigger a campaign mission, especially if you happen to spot a captain or two while running to the waypoint. Overall, I think the Nemesis system works well, but I do have a few gripes about it. Especially how a captain will be powered up, even if he's not the one to kill you. It's ok if he steals the credit if one of his underlings gets the killing blow, but I was once stuck locked in a battle and a caragor came up from behind and devoured me. The captain, who was within an inch of his life, gained power from my death! I screamed, "Come on, at least eat him too!" Similarly, I was left a little gun shy after losing a survival challenge, which caused a no-level punk to suddenly rise up the ranks and undo all my hard work thinning out the leadership. That was the last time the Gravewalker would give away a freebee. Watts: Yeah. Like I mentioned in my review, that sort of thing can snowball pretty easily. I kept inadvertently powering up a few captains until they were at max level and I was still just starting out. Funny enough, though, my strongest Nemesis and the one who most deserved the title was killed in an internal conflict with another Uruk who wasn't nearly as strong. It probably helped that I was picking at him from afar with my bow. To that end, the one thing that disappointed me a little about the Nemesis system was how it ended. I don't think it's a spoiler to say that eventually there's a battle with whoever has been designated your "Nemesis," but by the end of the game I had killed or converted the ones who were really bothering me the most. When I got to my version of the big climactic battle, it was just some random Uruk who I think had been around when I died once or twice, but no one I remembered all that well or that I really wanted to get revenge on. It didn't really detract from the experience, and I can see how they meant it to work, but it just didn't work out that way for me. Wong: Yeah, I wish you could could reply with a snappy comeback when some of these Uruk captains trash talk you. One guy popped out of nowhere and said something to the effect of, "You thought you defeated me, but now I'm back!" and I had no clue who he was. So, another thing that's kind of annoying about captain hunting is when they're immune to every special attack, and then make a run for it. I try to chase them down, but I've never been very good at chase scenes, even with games like Assassin's Creed. I'm always hot on their tail, but then they vanish. If the captain is immune to ranged damage, then you can't even use your bow to slow them down. I think captain that runs should be demoted, or soon see a power struggle for being a coward. It does get to a point where if feels like you're fighting against the tide. I get that you can't stop Sauron's rise to power, but it doesn't look like the Uruk suffer any from lack of leadership, even with half their captains dead. I was really hoping that filling the top ranks with losers would have some sort of impact, but the Uruk still seemed pretty effective. But I guess all that would eventually be worked out through power struggles. Speaking of which, I love how the loser of a power struggle is represented as a head on a pike in the Army screen. How did you like the Batman-esque freeflow combat? I thought it was pretty smooth going, not counting the occasional caragors. I had to get used to fighting in the open world, because I'd often be busy fighting a handful of Uruk, only to have another patrol come in and join, then another until I was overwhelmed. I eventually learned to use more Fear moves, but a couple of captains gained rank because the situation quickly grew out of control. Watts: I think the freeflow combat works really well, especially as you gain access to more moves, but you're right that it can definitely be overwhelming at first. That was part of why I died and got so many captains upgraded. Nowadays, though, I have the combo meter requirement lowered to 5 hits instead of 8. When I walk into an orc camp I'm basically just a spinning whirlwind of death, constantly getting my combo meter up and then hitting a few orcs with insta-death finishers. If the freeflow combat in Batman made you feel empowered as the Dark Knight, this has a similar effect in the Lord of the Rings world once you really get going. As for fighting the tide, I know what you mean. I wondered how Monolith would make this have an impact on the world that actually matters. Obviously Uruk are pretty plentiful no matter what you do, but at the end of the day you can't be the one to stop Sauron. I won't spoil anything, but I think ultimately the studio found a way to make your actions feel significant even if you aren't the one taking down the big-bad. Wong: The game might benefit from a few more online options, but the Vengeance feature is definitely a nice touch. It marks bosses who successfully took out other players, and challenges you to take them down on their behalf. I just wish I knew who I was getting vengeance for, and maybe get an alert if someone got vengeance on my behalf. I also wonder if Vengeance is a cross-platform feature. Who knows? 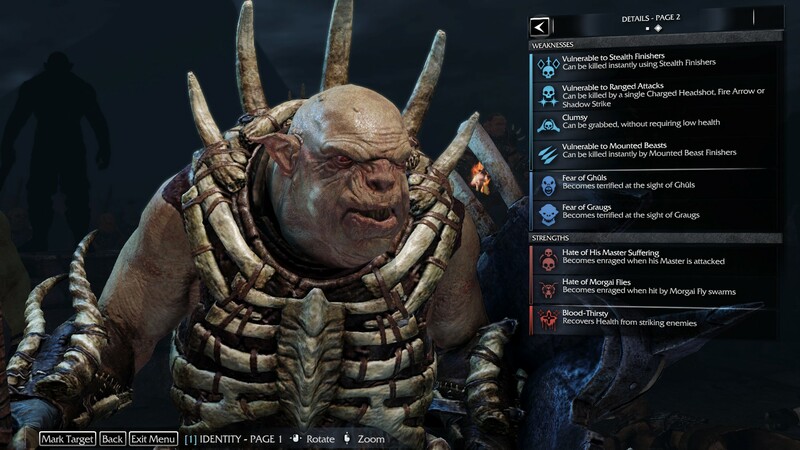 I could have ended up fighting that top level level Uruk you brought into power on your PS4 from my PC game. I also think it would be really cool if you could challenge someone on your friends list to defeat a captain that you couldn't, and essentially send them someone really tough to fight. But I'm pretty sure additional online content will be limited to global leaderboards available once the Challenge content becomes available. I really dig how the Uruk talk about you if you stick to a particular play style. Personally, I preferred drop down from high locations to murder Uruk, and later on I overheard them talking about how they lost count of how many people died from the Gravewalker dropping from the sky. I want to get to the point where I can just show up and flip my collar like the Fonzie from Happy Days and scare Uruk off. Even though I didn't play too much of the plot, I have to say, the guy who voices Gollum (it's not Andy Serkis) gets it spot on. That being said, I really like the game, but I'm not really getting a total game of the year sense from it. The combat borrows A LOT from Batman, and the stealth isn't as deep as some of the Assassin's Creed games. Watts: I like the Vengeance feature, even if it is a little fiction-breaking. It's a little hard to feel immersed in Lord of the Rings fiction when you're being told to avenge the death of Xx420LuvrxX. I'm sure I've left plenty of vengeance targets in other people's games though, because I died quite a bit. I think it's too early to put too hard a stake in the ground as GOTY, but it shot near the top of my list pretty quickly. I don't really fault it for borrowing elements from games like Assassin's Creed and Batman, since the real standout accomplishment is how well it makes all those systems work together, with the Nemesis system stacked on top of them. Is that innovative enough to earn it the big spot? I'm not quite sure on that yet, and we still have a lot of release season yet to get through, but I wouldn't be surprised if it's at least in my top 5. Wong: So, what was your favorite skill or combo? I especially liked being able to assassin drop on an unsuspecting soldier, using Brutality to repeatedly stab him and scare the weaker guys away. Then I use wraith stun on someone, preferably the captain, and follow-up with sword strike to bring up my combo chain count. With a little luck, I get to finish someone off by grabbing someone by the throat, draining his soul, and causing his head to explode. I thought that I'd enjoy the caragor riding skill a little more than I did. It's ok, but you can't pick things up or do combos will riding atop a beast. Caragors also seem to die a lot faster when they're fighting by your side than when they're just running wild. I guess that's the cost of domestication. Watts: That's fantastic, because I hardly used any of those skills. I liked the Pin in Place and Elven Swiftness for catching up with slippery Uruks who tried to make a run for it. Get back here, ugly, I'm not finished with you! Other than that, I leaned heavily on the ones that let me set up pretty nasty melee combos. Combat Drain mixed with Brand means you can Brand enemies, thereby taking control of them, right in the middle of sword combat. If you combine that with Blade Master, which reduces the threshold from 8 to 5, you can use it more often. Then if you combine that with Double Charge, you can brand two enemies in a row. It doesn't take long for me to turn a mess of Uruks into a huge mass of soldiers who fight for me. 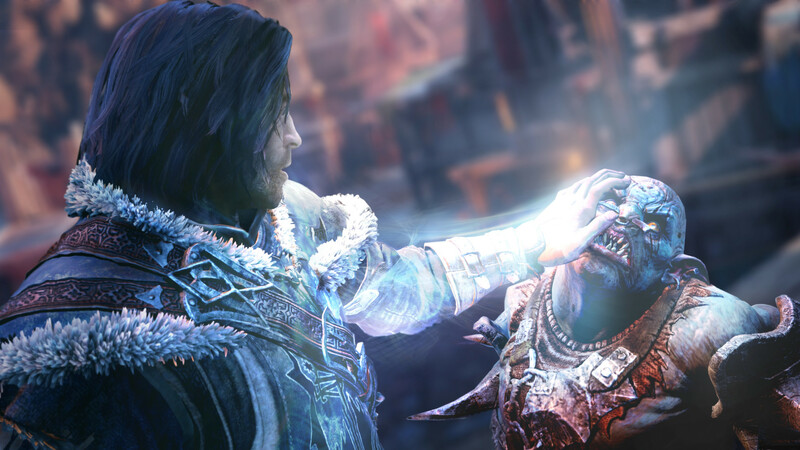 Shack Staff posted a new article, Shacknews Spotlight: Middle-earth: Shadow of Mordor. Interesting format. Surprised it's not a video. Something cool for people that like text. Thank god, I can read it on my phone at work. Sure, but maybe have it live out there as a video and type up the transcript for people who want to read it instead of watching. Yea, wasn't Greg in here asking for video content the other day, then asked what kinda Top 10 videos we would want to see? I'd much rather see this as video content that a Top 10 list. But also, the Steve's are in different states so they would most likely have to do this over Google Hangouts or something, but I'd still rather watch that. Patrick and Alex do a live show over GHangouts every Mon/Friday and the quality is fine. He wanted the Top 10 on top of our regular coverage. That wouldn't be the only thing our video channel is. You can already see the different content on our channel, with Rumpo's videos, the graphical comparisons, etc. Also, Andrew and I were talking earlier about having a Skype conversation about Smash Bros. That'll probably hit our channel later this week, as soon as we get around to chatting about it. I know, plus the live streams have been fantastic and I tune into those everyday. I was just saying, this would have also been a good opportunity to possibly do both a video and text transcript. It probably just wasn't considered at the time they had the discussion, but I would love to see more stuff like that. I gladly look forward to that conversation between you guys since I really like Smash Brothers! Thanks for the feedback guys. The Spotlights have generally been e-mail chains put into article form. It's not really that we're failing to upload the recordings as much as it is that there is no recording in the first place. If you want to hear us talking about it off-the-cuff, though, that's definitely something we can take into account the next time one of these spotlight-worthy games comes up. It's just a chance for us to have a little more off-the-cuff talk about a game without being quite as formal as a review, or as casual as a podcast. Knowing they were basically e-mail exchanges makes more sense that this was easier and probably quicker to put together in a article format rather than just re-discuss things you already talked about to each other in a video. Either way content like this is something I definitely would like to see more of in either context. It's better than a podcast. I much prefer text articles. It's rare I'm in a position to watch a video. I agree with the others here - I prefer the text format. It would be cool if their future video reviews/articles also included a transcript like this.